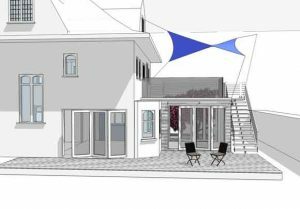 Planning consent has been granted for a garden pavilion and deck, which will be added to a large detached house on the sea front in Middleton on Sea, near Bognor Regis, on the Sussex coast. The small extension creates a deck for entertaining with stunning views to the sea just 100m away. The building is clad in a hard wearing timber like Siberian larch to combat the salt environment. We are looking forward to starting on site 2011/2012.